The following brief history of the Lakeville United Church of Christ, better known historically as the "Precinct Church", is taken from a souvenir program published as part of the church's rededication on June 18, 1972. Originally situated near the intersection of Precinct Street and Rhode Island Road in the Precinct neighborhood of Lakeville, the church was moved in 1970 to its present location at Precinct and Bedford Streets where it was restored to its present appearance. The chapel which was once attached to the church remains at in its original location at Precinct, indicating the site whereon the church once stood. In the year 1719 of this new and growing country, the Great and General Court of the Province of Massachusetts Bay granted to the inhabitants in the southerly part of Taunton and the westerly part of Middleborough a tract of land on which to erect a meeting-house. This was to be known as a Precinct and would carry on the business of such a Precinct, having all the powers and privileges by law to do so. On August 26, 1719, the Middleborough and Taunton Precinct was properly voted upon and established. In October of 1719, it was decided that the meeting-house should stand on Thomas Joslen's land, twenty rods east from his fence on the road that leads to Rhode Island. It was voted that every man shall work three days each week towards building the church. Thus started the formation of the first church in Lakeville which was then a part of Middleborough. In September of 1724, a committee of three was chosen to hire the Reverend Benjamin Ruggles as the first minister; and they voted to 'pay him seventy pounds a year-one-half in money and the other half in such pay as the Precinct could raise. His.ordination was held in November of 1725, and he served the parish for twenty-eight years. The first meeting-house burned, and a second building was erected in 1759. At this time, the Reverend Caleb Turner was called to be the minister at a salary of sixty-six pounds, thirteen shillings, four pence lawful money as a yearly income. He remained with the Precinct congregation for forty years. In 1795, there was a segregation problem within the church. Many of the church members owned black slaves who were not allowed in those days to attend worship services with white 'people. The compromise was the Precinct's purchase of the men's and women's pews in the galleries over the stairway for the use of black people. At this time, everyone owned his own pew and paid a rental of from ten to thirty-five shillings. When it was voted in 1834 to build a new and improved house of worship, it was decided to sell sixty shares at $50.00 each and to auction the pews to the shareholders. The old building was sold at auction and razed, and in 1835 the new meeting-house was built at the same location. This is the same church building we are now rededicating. The Reverend Homer Barrows was called as minister at a salary of $550.00. In those days, each pew was furnished by the owner with stools, carpets and cushions; and 'each pew had a door which was closed and fastened after the family was seated. There is no accurate record of what became of these doors. The pews at each side of the pulpit were known as "free pews" to be used by the poor who could not afford to rent them or by the Indians who dared to venture to church services. During the winter, the meeting-house was heated by two wood stoves in the entry with long pipes extending the length of the sanctuary. Inevitably, these stoves smoked a great deal by the time the services ended at the evening of the sabbath day. There were no offering plates, as only occasionally would a collection be taken for some charity stated by the minister and the Deacons would then pass their hats to each person in the congregation. A pump organ was built in 1830 and was used until 1961. To the side of the 'building was a long carriage shed with stalls for the horses. Most families came long distances by horse and carriage and stayed at the church the entire sabbath day for several services of worship and prayer, classes for the entire family, noon meal and fellowship. 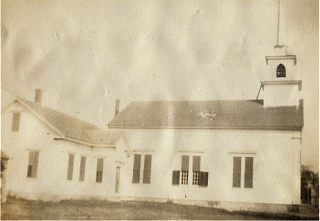 For some years, the Precinct Church was used for Lakeville Town Meetingsand for school graduations because it was the largest meeting place in town. In July of 1923, the 200th Anniversary was observed for which the church was filled to capacity. In 1930, the Precinct Church voted to join the Rochester and Lakeville Larger Parish with three other churches, thus sharing the ministers and combining religious and social activities. This program continued for eight years; and since then, the parish has continued to offer its members and friends services of worship, a Church School, youth groups and a women's fellowship. In 1954, the Precinct Church was renovated and rededicated under the leadership of the Reverend T. Merton Rymph. Many dignitaries attended the services. In that same year, Hurricane Carol struck the church and destroyed the steeple. This disaster prompted a steeple fund drive; and through many generous contributors, the steeple was replaced in 1960. In 1875, when the Precinct Church was changing its name to "Lakeville and Taunton Precinct Society", a group of people were dedicating another house of worship called "Union Grove Chapel". This church was built at a cost of $1,600.00. The land was given by Sidney Tucker and his wife Sarah of Middleborough. The building was constructed by men of the neighborhood, and the organ was presented by friends in New Bedford. The first pastor was the Reverend William Leonard who continued to serve the parish until 1881. In April of 1927, on Easter Sunday, the church became the "Grove Chapel Congregational Church" and entered into fellowship with the Massachusetts Conference of Congregational Churches and was given standing in the Old 'Colony Association of Congregational Churches, as was the Precinct Church. In October of that same year, the bell was moved from the old Bell Schoolhouse to the church where it was consecrated. In 1929, this church also became a member of the Rochester and Lakeville Larger Parish. With the dissolution of the Larger Parish, the church called the Reverend John Hunt as minister in 1939. For many years, this church was supported by an active Ladies' Group organized in 1919 called the "Comrades Club". These ladies worked to have a kitchen built at the back of the chapel and to have electric lights installed. The group was later known as the "Ladies' Aid". For a period of about fifty years, the two churches struggled to continue their services of worship with part-time and shared ministers and with diminishing congregations until, on many Sundays there would be 'but four or five worshipers at Grove Chapel and one or two dozen worshipers at the Precinct Church. In the early and mid-1960's, with the inspiration of several church members and with increasingly convenient modes of transportation, the people of the two churches began to realize that they were neighbors and should join together. Then, in May of 1964, some of the "idle talk" became a reality; and meetings were held to discuss a united church. For some time, the results of these discussions led to union services of worship alternating monthly between the two churches. And on March 12, 1965, the two churches united to form the "Lakeville United Church of Christ". The new church was incorporated on June 19. 1966 with its constitution and by-laws being adopted. The new parsonage was built on land given by Mrs. A. Hamilton Gibbs; and nearly five acres of adjoining land were purchased from the City of Taunton as the location for a new church facility. The Reverend Frederick W. Lyon was called as "pastor and teacher" and began his ministry in February of 1967. In the past few years, a decision was made to sell Grove Chapel and to use the Precinct Church because of its larger size until a new church could be built. The proposed new facility being too expensive to construct, the congregation decided to move the Precinct Church to its present location for restoration and renovation. This momentous decision could not have become a reality without the determined efforts of the Restoration Committee and the members and friends of the church. We express our deep and lasting appreciation to the members of the Lakeville Church of the Nazarene for permitting us to use their church each week for the past two years. Following the merger of Grove Chapel and Precinct Church and the decision to restore the Precinct Church building, a restoration committee was formed and they energetically began plans to move the church to a five acre lot on the corner of Precinct and Bedford streets. Mr. George Church of Rochester was hired for the task of moving the one hundred ton 'building a distance of one and one half miles. Many church members and spectators were gathered at 7:30 A. M. on December 18, 1969 to watch the church begin its journey, but, unfortunately, after moving a mere eight feet, an axle broke on the specially built trailer on which the church was being hauled. This and many other problems caused postponement of the move until April 13 1970. This second attempt was successful and the trip was completed in four days as planned. From the time the church began moving until it was safely "parked" next to its new foundation, the progress of the seventy-eight foot tall building was the chief topic of conversation in Lakeville. For those four days, anyone with a few spare minutes would run down to Precinct Street to see how the church was doing. Mothers with babies in strollers, children of all ages, business men on coffee breaks or lunch hours, older folks seated beside the road in lawn chairs-all took advantage of the sunny spring weather to keep track of the move and inform newcomers of the latest happenings. School children from nearby Assawompset School were even allowed to leave their classes and walk to the Town Hall to watch the final leg of the historic journey. Although residents of Precinct Street had a front row seat to view the proceedings, church members regretted the inconvenience caused them by the move. They had to put up with disrupted power and phone service, having trees and shrubs cut along the street in front of their homes, as well as the general confusion created by the passage of the church building. The Middleboro Electric Company, who so capably handled the complicated job of removing and replacing the electric wires and poles, made the task of the movers possible and their cooperation was much appreciated. When the church finally reached its destination, where excavation and grading had been done through the courtesy of Lakeville Sand and Gravel, it was placed on the foundation and the actual restoration work was begun. The building was replastered, rewired and repainted and new carpeting and cushions were installed. Unusual arched fan like paintings were discovered when the old plaster was removed. Mr. Robert Bradshaw, an artist from Taunton, duplicated these paintings over each window. in the sanctuary. Also, antique chandeliers and side lights were refinished and a reed organ from Grove Chapel was repaired and moved to the church. The large basement was panelled and carpeted and folding partitions were installed, providing much needed space for Sunday School Classes. A modern kitchen was also included in the basement, which will make it much easier for the women to serve their many suppers. Also restored was the church bell, which hadn't been used for many years. It was dismantled and repaired and rang for the first time at its new location on Easter Sunday. Outside work included retaining walls, provided by Brant Haworth; blacktop driveways and parking areas; new lawns; and floodlights which light the belfry each night. Now the task is completed and the restoration committee members- Abraham Van Lenten, chairman, Mrs. Marguerite Mills, Frank Jenkins, Mansfield Whitney, Donald DeMoranville, Robert Mann, Neil Newton, Richard Williams and Wallace Wilkie-wish to thank all those members and friends who have worked so hard to help with the many tasks which were necessary for the restoration of this church which we are now dedicating. Today, the struggles and dreams of former ministers and members and friends of this church are being realized. And it is with a real sense of appreciation for the past, of 'satisfaction with the present and of hope for the future that we now rededicate the people and the building to God. We know that this church will be of service to the community and area for many years to come. And we now invite all members and friends of the area to join with us in becoming the Church of Jesus Christ. 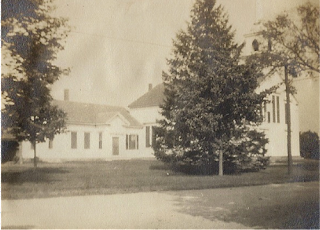 The photograph depicts the church in its current location facing Dickran Diran Square at Bedford and Precinct Streets in Lakeville. The church was originally located in the neighborhood known as Precinct at the intersection of Rhode Island Road and Precinct Street. The chapel which was later built on the southwest side of the church is clearly visible in this view. In 1970 when the church was moved to its present site, the chapel was left behind. It has since been restored and remains a notable landmark at Precinct. The map shows the route which the Precinct Church travelled during the course of its four-day relocation from Precinct to a site near the Lakeville Town House. I just found your blog. My father grew up in Plympton and Middleborough, my mother in Middleborough, and most of my great-aunts and uncles still reside in Middleborough and Lakeville. If you ever come across information about Emma Anna (Murphy) (Regan) Shaw (wife of Erastus Shaw, married in 1888, she ran a grocery store out of their home in Middleborough), I would be extremely interested in it. I'm going to do some reading now on your blog and check out the wonderful things you have posted!